Chances are you're familiar with QR codes by now. You know, those convenient, powerful and free tools that every business should consider using in one way or another. If not, you can read QR Codes A Dialogue Between Physical and Virtual Worlds. There are literally thousands of ways for a business to use QR codes to its advantage. A call to action, a tangible offering, a way to save your customers time, efforts, and money these are some of the most popular and beneficial ways in which businesses use QR codes. If you're a nonprofit, use it to make donations through PayPal much easier. If you're a restaurant, provide access to mobile-friendly menus and premier happy hour discounts. But wait, there's more. Much more. The payoff for businesses is increased brand awareness, more user interaction, and new potential customers. As far as those people scanning your QR codes, well, they can gain access to coupons, exclusive content, promotional deals, and special offers, as well as images, text, videos, links, contact information, social media sites, and the list goes on. A QR code can even be used to gain a new Like on Facebook with nothing more than a simple scan. Pretty cool, huh? The most likely place to find these codes is in print materials, such as magazine and newspaper advertisements, business cards, flyers, stickers, posters, receipts, invoices, and direct mail. However, the fun doesn't stop there. You can also find them on t-shirts, coffee mugs, and even store signage reading Closed, but scan the QR code in the window and immediately be transported to the business' website, online store, or a place where users can view contact information, leave a message, fill out an opt-in form, or send an email. The need for QR codes is becoming as commonplace as the need for a website. And creative professionals are coming up with new ways to use QR codes all the time. For example, some businesses use them as games or to send people on scavenger hunts, in which prizes are given away to users who scan numerous codes in succession. But no matter how the QR code is used, it must take people to something relevant and valuable. Wasting potential customers' time will turn them off, and that typically doesn't work out well. Customized QR codes, complete with logos and colors and such, can add a certain flair, garner extra attention, and increase brand recognition. The fact that they are so versatile and free makes using these interactive, customer engagement-driven QR codes a no-brainer. It's really about how creative your business is willing to get with this technology, and that's part of the fun after all. Users, on the other hand, are enamored with the mystery behind these tiny black and white boxes, leaving you the perfect opportunity to use this element of the unknown to your business' advantage by playing to people's excitement and tickling their curiosity bone. Just remember, they'll be viewing this information on their smartphones, so the content has to be mobile-friendly. 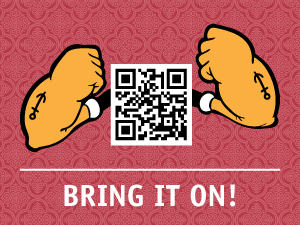 These days, QR codes are really just the starting point. And as fun and useful as QR codes can be, there are newer and even better options becoming available all the time. As new technologies are developed, the simple codes we scan are evolving into much more innovative tools for interacting with your customer base. For example, a couple of years ago it was Tag; now it's invisible ink technologies and augmented-reality apps like Blippar and Touchcode that are paving current marketing and branding strategies. Their mission: to replace clunky QR codes and re-establish the way a business interacts with its target audience. P.S. This information was provided by Ruff Haus Design - Your Loyal Marketing Companion. Established in 1997, we are a special breed of full-service graphic design company that works with a premier pack of clients. We bring a fresh outlook and tail-wagging enthusiasm to your marketing program.